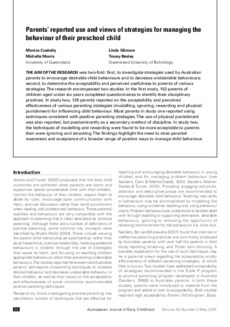 The aim of the research was two-fold: first, to investigate strategies used by Australian parents to encourage desirable child behaviours and to decrease undesirable behaviours; second, to determine the acceptability and perceived usefulness to parents of various strategies. The research encompassed two studies. In the first study, 152 parents of children aged under six years completed questionnaires to identify their disciplinary practices. In study two, 129 parents reported on the acceptability and perceived effectiveness of various parenting strategies (modelling, ignoring, rewarding and physical punishment) for influencing child behaviour. Most parents in study one reported using techniques consistent with positive parenting strategies. The use of physical punishment was also reported, but predominantly as a secondary method of discipline. In study two, the techniques of modelling and rewarding were found to be more acceptable to parents than were ignoring and smacking. The findings highlight the need to raise parental awareness and acceptance of a broader range of positive ways to manage child behaviour.